This health protein supplement powder has no aspartame, is low on lactose and has high mixability. Consume 1 scoop (33g) in 190-210 ml water and take 1-2 shakes per day for best results. 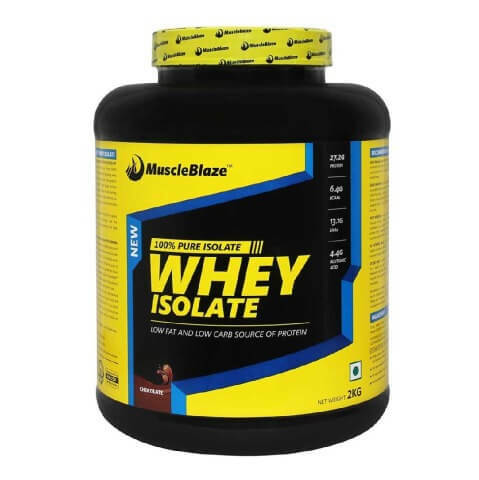 Whey Isolate comes with 27.2g protein, 6.4g BCAA and 4.4g of Glutamic acid per serving (33g). It is a superior quality whey protein developed using micro-filtered technology.. It helps in increasing your workout performance and endurance to help you train for long hours. The main function of protein is aiding in growth and repair of muscle and other body tissues. So, higher protein in diet is better to gain body weight. Highest protein was found in Endura Mass and lowest in Knoll. For all physical activity, the body requires energy – the amount depends on the duration and type of activity. Energy is measured in calories and is obtained from the body stores or the food we eat. Carbohydrate provides 4 kilocalories of energy per gram, protein 4 kilocalories per gram, and fat 9 kilocalories per gram. Highest energy was found in Endura Mass and lowest in Body Grow. To Recieve updates and possible rewards for MuscleBlaze Whey Isolate, 4.4 lb Chocolate please sign in. To Recieve updates and possible rewards for Diet Supplement please sign in.